Elsewhere on this site you’ll find a near rave review of the Audi A6 4.2 quattro tiptronic saloon, the 3.0V6 TDI quattro tiptronic saloon and the 3.2 V6 petrol SE front-drive 6-speed manual saloon. So, for driving impressions of those engines, please go to that test. Here I get to drive the 2.7V6 TDI front-drive 6-speed manual Avants, the 3.2 V6 petrol front-drive 6-speed manual Avant, a 3.2 V6 petrol front-drive 7-speed multitronic Avant, and a 2.4 V6 petrol front-drive 7-speed multitronic Avant. It would have been nice to complete the picture with a 2.0 TDI 140 multitronic and a 2.7V6 TDI multitronic, but none were available on the day. 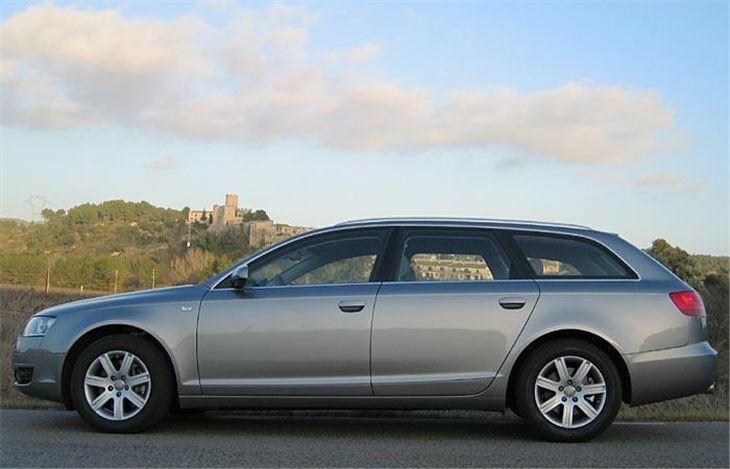 The new Avant is a big car, longer than the saloon and 4mm higher. It’s also very beautiful, both sleek and perfectly proportioned, and that shape brings the added benefit of uncannily low wind noise. Crucially, the roof is higher over the heads of rear seat passengers and comfortably accommodates three. 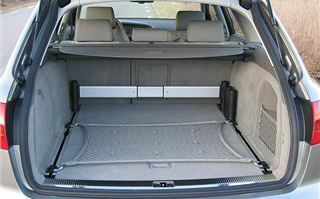 The luggage area is long, and wide; more than a metre even between the rear wheelarches and 1.2 meters right at the back, which is handy for golf clubs. Seats up, there is 565 litres of loadspace to window level; seats down 1,660 litres to the roof. Access is via an electric lifting tailgate like the Honda Accord Tourers and the Mercedes E-Class estates. This can be set to open to various heights to suit opening it in a garage with restricted headroom. 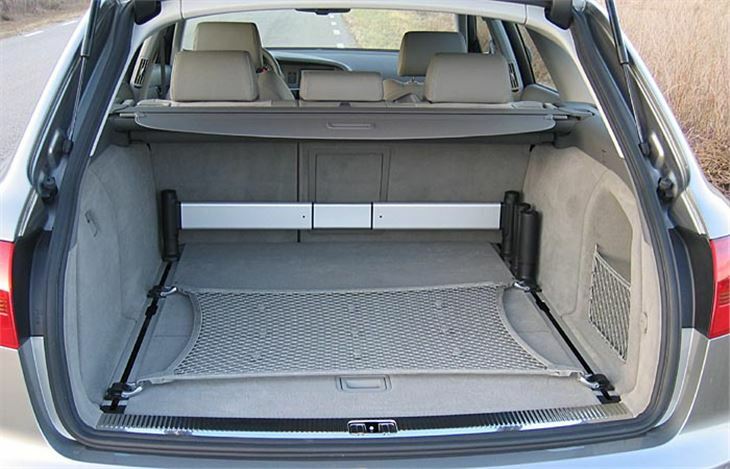 There is a standard, versatile rail, bar and strap system for neatly restraining luggage, plus a load net, and a protective flap that folds out over the rear bumper to protect it when loading and unloading. Under the floor you have the option of a full-size spare wheel, or a standard plastic well for things like muddy Wellingtons. 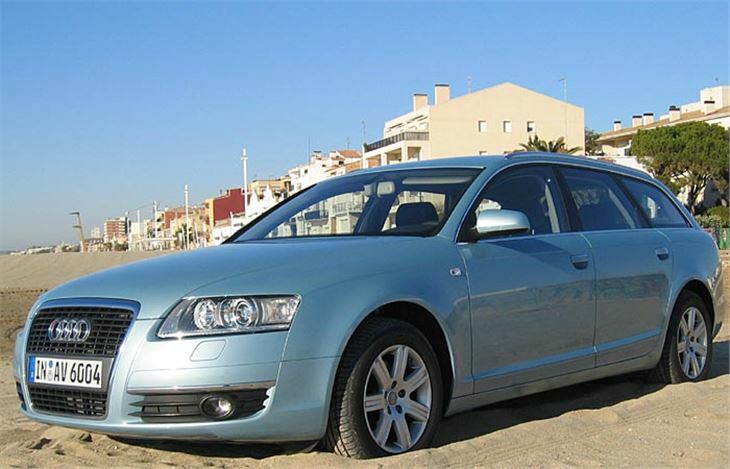 Air suspension with variable ride height (developed on the old Allroad) is optional. So are extra bright LED tail lights (that never pop a bulb). And optional radar adaptive cruise control that allows you not only to set a cruising speed but also to set the minimum distance the car can be behind another vehicle. If the system senses you getting too close anyway, it automatically brings the brake pads closer to the discs so you can brake nanoseconds more quickly if necessary. Yet another innovation is a trailer stabilisation system that automatically helps get car and trailer back into shape if the trailer begins to swing. All have the same automatic parking brake as A6 saloons as standard. Pull a little flap switch to apply the brakes, then either just touch the footbrake or flip the flap to drive off again. So on to driving impressions. 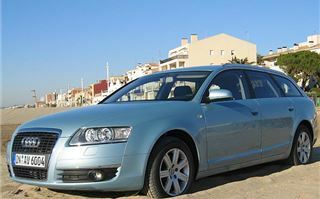 ‘Autocar’ rated the new 2.7TDI very highly and it’s certainly an impressive car. 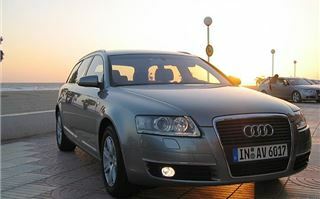 Cheaper than the quattro-tiptronic-only 3.0V6 TDI and available with either a 6-speed manual or 7-ratio multitronic CVT. The 6-speed manual gives a top gear speed of about 32mph per 1,000rpm, about the same as the Ford Focus 1.6 TDCI 5-speed and around 3mph lower than Ford/PSA 2.0 TDCI 6-speeders. At first, the steering feels over-light, but stiffens up as you drive. There’s a bit of understeer if you press on, though you need to be pushing fairly high speeds for the corner to encounter it. The disappointment is the clunkiness of the cable gearshift. This varied from car to car (I tried two 2.7 V6 TDIs) and was a lot worse in the 3.2V6 petrol 6-speed I drove next. The engine has a wonderful howl and is a pleasure to listen to. But the shift from 2nd to 3rd on that particular car was diabolical. The 7-ratio paddleshift Multitronic is a far better bet, allowing tidy downshifts while braking into corners, and powering out cleanly whether you are working the box manually or leaving it to its own devices. That’s the beauty of the seven ratios. Unlike torque converter automatic 4 or 5 speeders, you’re never stuck slurring away between inappropriate ratios or downchanging halfway round a bend. You’re always in the right gear. 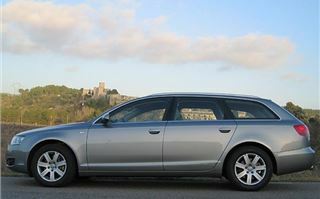 As described before in the 2005 A4 road test, this engine and transmission is a formidably quick combination, but, so far, it’s not in the UK A6 line-up. No problem, though. The nice surprise of the day was the 2.4 V6 petrol multitronic, because in this combination the 7-speed box helps you make the most of every horsepower the engine has. So, far from feeling the poor relation of the 3.2, you can actually enjoy a less aggressive, more satisfying drive. 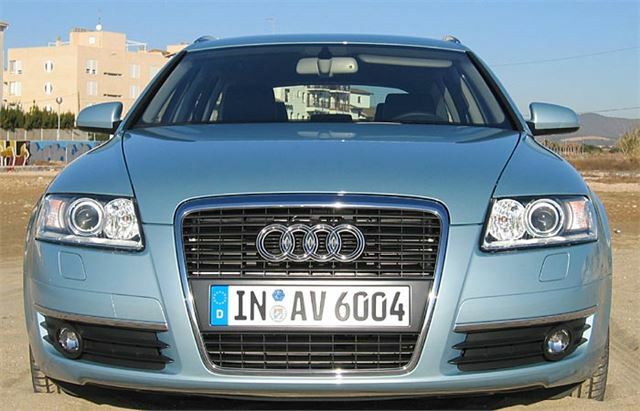 And that’s without quattro four-wheel-drive, or the S line sports suspension. So, more stunningly good A6s. Not a duffer amongst them. The only Achilles heel is the lousy gearchange of some of the 6-speed manuals, which I guess Audi will attend to on production cars.